A pleasant walk near Tukvar, Darjeeling. bl.uk > Online Gallery Home	> Online exhibitions	> Asia, Pacific and Africa Collections	> A pleasant walk near Tukvar, Darjeeling. 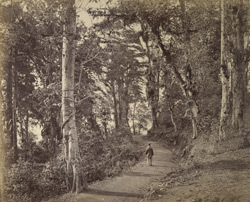 View of a man on a forest walk in Darjeeling, taken by Samuel Bourne in the 1860s. Darjeeling in the Eastern Himalayas is built on a long spur projecting northwards like a letter Y from the Senchal-Singalia mountain range and descends the hillsides in a series of landings. From 1835 when the British gained possession of it, Darjeeling was the summer resort of Bengal. Tea-growing was introduced here and it is surrounded by terraces of tea gardens.